Sacramento has become a seriously burgeoning bike-centic burg. These days, the River City is experiencing a two-wheeled renaissance that’s made biking easily accessible to just about everyone. For Lorena Beightler, an avid cycling commuter, blogger and fashionista, this recent velo-lution is a perfect fit. Beightler is the voice behind SacCycleChic, a blog she began in 2008- modeled after the world famous CopenhagenCycleChic – which endeavors to highlight the virtues and benefits of bicycle riding in fashionable and functional attire. Beightler, a youthful and exuberant grandmother, lives for both fashion and bicycling. 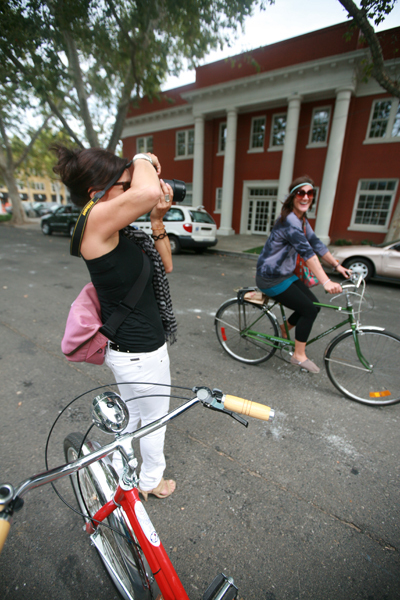 It seemed only natural, then, for her to start Cycle Chic Sundays – a monthly bicycle tour that educates riders about Sacramento’s history while demonstrating that cycling doesn’t belong strictly to the Lycra-clad set. Beightler’s version , which takes place the third Sunday of every month, highlights a different historic Sacramento landmark that locals may not be familiar with. For the inaugural ride last August, Beightler led her fashionably-clad crew of 28 cyclists from Old Sacramento to the Leland Stanford mansion for a docent-lead tour. On the way back to Old Sac, Beightler steered the tour over Ed Cox’s recently repurposed freeway overpass, the R Street bicycle bridge. After the ride, Bowles sent Beightler a personal letter of appreciation, noting that the ride not only inspired her to start cycling every day, but shook her out her funk as well. “It broke the spell,” Bowles declares triumphantly. 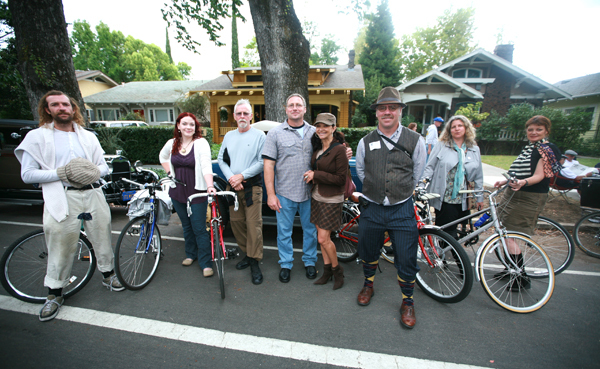 Indeed, for someone who moved to Midtown in 2005, Beightler has proven to one of Sacramento’s most vital ambassadors for local bicycling advocacy. Whether she’s snapping pictures of stylish cyclists for her blog, organizing her group rides or co-founding Velo & Vintage (Sacramento’s premier bicycle-related fashion event), Beightler’s wheels are always spinning. For next month’s Sac Cycle Chic event, Beightler is planning a tour of the historic City Cemetery on Broadway and Riverside Boulevards. If the previous two rides are any indication, this should be yet another fun-filled and educational tour. If anyone can make that happen, it’s Lorena Beightler. Lorena’s legs alone make me want to cycle more. Great article. I can hardly wait to attend my first Cycle Chic Sunday. Well this is a very cool artical… I would say it is an even cooler group activity for a sunday in one’s month. I started going in august. What a blast….. I think it would be a good thing to get more people of advocating power on this ride, it’s educational, you get to exercise… We do need more competancy in our infastructure when we do things such as work on roads! Maybe if our city’s officals instead of going to the gym… Took a bicycle ride they may appreciate what is a slower form of transportaion is like, or maybe a faster form if they ride the buss??? I highly endorse the idea for everyone to take on this ride. Sac-Town is a great city for cycling-cause it’s flat. So, if we can all ride (and look good at the same time), then that makes Sacramento full of win. Great article. I hope Lorena helps educate participants about following the rules of the road, staying off the sidewalks, and being a courteous cyclist! So if Sacramento is such a great city to bicycle in, why do they all find it necessary to ride on the sideWALK? I went to college at UCDavis and love the bike culture… at least one that includes keeping off the sideWALKS. Sack (Sac?) up and ride in the street where you belong, or put the bike away and walk. I think this is great, although riding without a helmet is idiotic. Looking cute is not worth risking brain damage (or death).